At long last! We were able to find palm oil free toothpaste. While you usually won’t see “palm oil” on ingredient labels, it’s usually present in the form of derivatives such as Glycerin, SLS, and more. Manufacturers often use palm oil for sweetening and foaming in toothpaste. Even most natural, healthy-looking toothpaste brands contain palm oil in some form. They’ve confirmed they make their toothpaste without palm oil. In addition, 98% of their ingredients are from the United States — in order to support American jobs — including their glycerin which is derived from non-GMO soy. It’s free from sulfates, fluoride, artificial flavor, color & preservatives. It’s vegan and cruelty free. The carton is made from 100% wind power as well and is recyclable. There’s lots more great info about this company on their website. 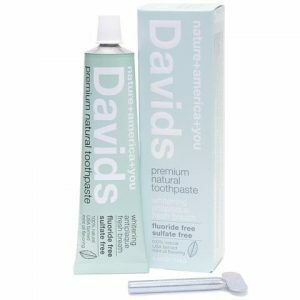 We just purchased Davids Premium Natural Toothpaste and will update after we try it. In addition to not containing palm oil derivatives, Earth Paste is free from foaming agents, artificial coloring and is fluoride free. On a personal note, my son started using Earth Paste Lemon Twist, and it solved our issues. Prior to finding this palm oil free toothpaste, he had really bad chapped lips, including some of the skin around his lips, for weeks. Within just days of using Earth Paste toothpaste, his lips completely healed. Since using this brand of toothpaste, he hasn’t had chapped lips, cracking on the sides of his lips/mouth, or any mouth-sore issues whatsoever. He has reactions to palm oil in foods, and we didn’t realize it was also in personal care items, including toothpaste, soap, lip balm, etc. Updated to add my son didn’t have cavities at his recent dentist appointment. He’s used Earth Paste for 6+ months. We just learned about this palm oil free tooth cleaner. It’s a liquid, not a paste. 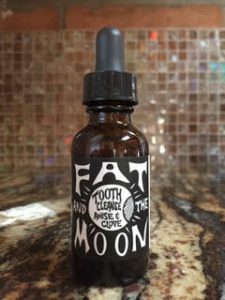 My son started using Fat and the Moon’s Tooth Cleanse to switch up his oral care. We are always happy when we find palm oil free products and love to try them. You only need 2-3 drops on your toothbrush. The bottle will last a long time. My son likes that it foams. He said it feels like his teeth are getting clean. This palm oil free toothpaste alternative is also fluoride-free. The ingredients are Castille Soap (Water, Organic Coconut Oil, Organic Sunflower Oil, Organic Castor Oil, Citric Acid, Rosemary Extract), Organic Myrrh Tincture, and Essential Oils of Organic Anise and Organic Clove. As a side note, most castille soap contains palm oil derivatives. It’s remarkable Fat and the Moon spells out the ingredients in theirs and that it’s palm oil free. We verified with Fat and the Moon their Anise & Clove Tooth Cleanse is palm oil free. They also offer a Tooth Polish for once-a-week use. It’s geared more toward adults to help prevent coffee stains, etc. This tooth polish is made without palm oil derivatives. At first, we went to Whole Foods and Trader Joe’s, hoping to find toothpaste without palm oil. After reading all the ingredients, we thought we found two of them. After a week of trying each, my son still had extremely dry lips. I looked up the ingredients on both toothpastes and found out both had hidden palm oil derivatives. Afterwards, I found Earth Paste at a natural grocery store, and it’s been a miracle for us. My son needs a palm free toothpaste, and this works for him. He’s been alternating between the Lemon and the Peppermint. And now that we’ve found Fat and the Moon, he will add their Tooth Cleanse to his rotation. When a toothpaste advertises it is SLS free, that means it doesn’t contain Sodium Lauryl Sulfate. SLS is controversial for many reasons. For our purposes, we avoid products and toothpaste with SLS because it is often made with palm oil. You may see toothpaste brands advertise themselves as SLS free and assume they are palm oil free. Know this is not always the case. Some SLS-free toothpastes use Sodium Methyl Cocyl Taurate instead of Sodium Lauryl Sulfate. Manufacturers consider this ingredient to be milder and less irritating; however, it is still a synthetic surfactant. Also, if you are looking for a toothpaste without palm oil, you will want to avoid both SLS and Sodium Methyl Cocyl Taurate. According to the International Palm Oil Free Certification Accreditation Programme, like Sodium Lauryl Sulfate, Sodium Methyl Cocoyl Taurate is considered a palm oil derivative. Toothpastes that don’t contain palm oil also don’t foam. So if a toothpaste label says “no foaming agents,” there’s a better chance of it not having palm-based ingredients. Also, you may have luck seeking out non fluoride toothpaste. This is because toothpaste without fluoride often has less ingredients overall. Don’t assume just because you buy organic toothpaste that it’s free from palm oil. You still have to read all ingredient labels. Many organic toothpastes contain glycerin and other palm oil derivatives. We have been unable to find palm oil free toothpaste with fluoride. There are many uses for palm oil. Manufacturers use it in a multitude of ways, under hundreds of names. It’s a versatile oil. However, once you learn how to find products without palm oil and the names for palm oil, it gets much easier. Many self-care products that are free from palm oil use coconut instead. You can choose to make your own toothpaste without palm oil as well. Many homemade recipes use baking soda. Due to palm oil deforestation, many consumers want products without palm oil. It’s hard to avoid it altogether, but there are certain palm oil products to avoid that are easy to replace. Do your best to support palm oil free toothpaste. We are so grateful to Earth Paste and to Fat and the Moon for making tooth cleaners without palm oil. If you know of others, please post in the Comments. For information on other self-care and hygiene products, see shampoo without palm oil, lip balm without palm oil, sunscreen without palm oil, and soap without palm oil. We are not medical professionals. Please consult with your physician and dental health care provider before changing dental health routines. This list is meant to be a starting point. Read labels. I just want to thank you for doing this extensive research on Palm Oil and Palm Oil by products. I recently started having severe allergic reactions to what seemed like everything, until I stumbled across your blog in the search of what could be the culprit. You brought to light that it does indeed seem like I have developed a severe allergy to palm oil after I realized it was the ingredient that was in common with everything I was reacting to. I feel like you’ve saved my life by enlightening me and by helping me navigate which products to avoid and which are safe. Thank you, thank you, thank you! I suffer on a daily basis and even went to the hospital for help and all they did was give me a 24 hr allergy medication which made me violently ill for 3 days until it finally left my system. I am having to also enlighten the doctors that have been trying to figure out what was wrong with me. I know there is a lot of ground work I still have to do, and it will be a constant struggle to deal with since its hard not to be exposed to this ingredient but at least I feel well informed because of you and your family. God bless you! Dear Ashley, Thank you so very much for taking the time to write. I am sorry to hear how much you suffer from palm oil. We wish you the best of health and patience as you navigate labels. Print out the list of alternative names for palm oil derivatives and reference it before you buy anything. Doing this all the time has greatly decreased the times my son has gotten sick. It gets a lot easier once you know the way companies use palm oil, the types of products it’s in, and the common palm oil derivatives to look for in the categories of products you buy. My son and I pretty much assume everything contains palm oil, and it’s the exception when it doesn’t. It’s not worth him having something and getting so sick. I hope you will continue to talk with your doctors about this as we continue to do. Our doctors, pharmacists, nurses — even people at the stores when they see us reading labels. It’s all an opportunity to educate. By simply reading labels, and buying the products that don’t have palm oil and palm oil derivatives (and in many cases having to make our own products) we can all make such a difference. If you are inclined, write to companies who have now started using palm oil, and try to get it through to the decision-makers within the companies. Let them know you are not buying their products. Support and thank companies who are making their products without it. Again, make sure to thank the decision-makers. Tell them about Palm Oil Free certification labeling. You and my son are not alone from having bad reactions to palm oil — so many people read our post about it. Couple these serious and adverse health reactions to palm oil plus all the environmental reasons to avoid it, and hopefully companies will start learning it’s a huge marketing position to make and advertise their products as being palm oil free. Thank you again for taking the time to write. I showed your beautiful comments to my son, and he (and I) just lit up. I have an allergy to palm oil too and I am slowly finding products I can use. The toothpaste I found I can use is – David’s Toothpaste https://davids-usa.com. Their customer service confirmed to me that none of their ingredients are derived from palm oil. Hello Tammy, Thank you for writing. I am sorry to learn you have reactions from palm oil. I’m glad you figured out that is what has been bothering you. We really appreciating you writing with this suggestion. It’s been incredibly difficult to find toothpaste without palm oil. Even when brands advertise their products as Glycerin free and SLS free, we are learning they typically contain palm oil derivatives. We will reach out to David’s and will hopefully be able to include them on this list. Wouldn’t that be fantastic to have another company to choose from! Thank you again. We wish you the best of health and patience as you learn about more products you can have. They are out there! Keep reading labels and matching them against the hundreds of alternate names for palm oil. Best wishes! Hi Tammy, We wrote them David’s Toothpaste on 2/4/19 and followed up twice since. We will update when we hear back. Thanks again for the suggestion. Yay! Davids Premium Natural Toothpaste is palm oil free. Thank you, Tammy! We just ordered it.